Why do we like this list? It will “introduce you to important Filipino personalities, events, folklore and a thing or two that the Internet won’t tell them”. Indeed! Just before my kids’ Christmas break, I stopped by Fully Booked at The Fort to get a few titles for my tweens to read during extended home time. I usually get their reading material from Booksale, but this time I wanted to get them the latest titles. 1. Spaceheadz. “The perfect combination of the age-old experience of holding and poring over a physical book with newest media technology.” Well said! 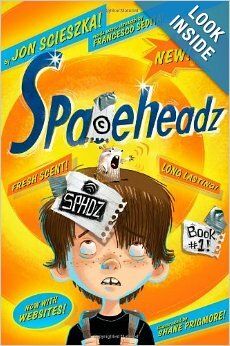 Spaceheadz is the current favorite of the family. 2. Dragonbreath. Does your child read only comic books? This series combines comic book panels and text to tell a story. Just might succeed in weaning your tween over to chapter books! 3. The Books of Elsewhere. “Creative, exciting, hilarious, spooky, mysterious, adventurous, heaps of fun!” With all those adjectives, how could you go wrong with these books? 5. The Homework Machine, and other books by Dan Gutman. My daughter had lots of laugh-out-loud moments while reading The Homework Machine — explains why Dan Gutman is a best-selling kids’ author. 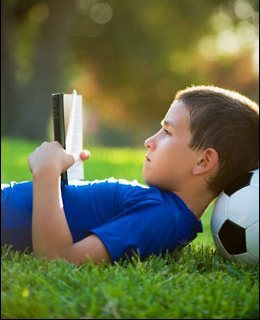 Hardy Boys and Nancy Drew were cool back in our day, dear parents, but there are lots of new authors who know what today’s kids enjoy more. And if you want to understand your kids better, read what they read. It’s not only rewarding, it’s fun! By Vanessa Bicomong is a manager and personal book recommender at The Learning Library. Is it difficult to make your 10-year-old pick up a book at home? Don’t despair! It often takes just One Good Book to turn on a reluctant reader to the joys of reading. 1. Geronimo Stilton. Lots of illustrations, with chapters as short as 2 pages! A good choice for kids just getting started on chapter books. 2. Captain Underpants. Part comic book and part chapter book, this is boy humor through and through (as its runaway success proves). 3. Charlie and the Chocolate Factory, Matilda and other books by Roald Dahl. While Charlie is the best known, Matilda is the one book that Roald Dahl was satisfied with when he finished – the only book he never felt that he had to rewrite. 5. D’Aulaires’ Book of Greek Myths. “All the great gods and goddesses of ancient Greece are depicted in this big, beautiful classic, lovingly illustrated and skillfully told.”This is a book for tweens and teens that you can order through local bookstores. And it will be worth every peso. 2. Millions. If you’ve ever gone to a Catholic school and/or dreamed of becoming a real millionaire as a kid (better both!) then you’ll take to this clever, funny, unique story. 3. The Artemis Fowl series. A juvenile James Bond operating in the fairy world, with very entertaining and likeable friends. Book 4 (The Opal Deception) is probably the best. 4. Percy Jackson and other series by Rick Riordan. Famous for good reason. Part of required reading in some schools – and for once, students aren’t complaining! 5. The Secret Series by Pseudonymous Bosch. Consistently rated 5 stars out of 5 by both parents and kids. This series is not just secret, it’s… super! I just realized that the first 4 books have been adapted either for TV or the big screen. Proof of kid appeal and a good sign that your reluctant reader would like them, too! How about the Harry Potter? I’ve found that his story as told by JK Rowling is a bit too dense for reluctant readers (especially the first instalments). Have them cut their teeth on more accessible titles first. Don’t force books that don’t really appeal to them – even if those were the books you loved growing up. When it comes to reading, get them through the door first… and soon they won’t want to leave the room.